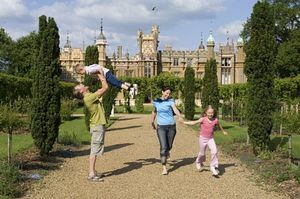 The Lytton family have lived at Knebworth for 500 years. 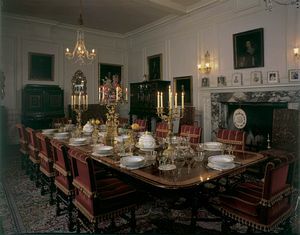 Queen Elizabeth I stayed here, Charles Dickens acted in private theatricals in the House and Winston Churchill's painting of the Banqueting Hall hangs in the room where he painted it. A walk through the House is a walk through history. Robert Lytton, Viceroy of India, proclaimed Queen Victoria Empress of India in 1877. Constance Lytton, militant suffragette, fought for votes for women in the early 1900s. Originally a red-brick Tudor manor house, it was transformed in 1843 into the Gothic fantasy we see today, with turrets, griffins and gargoyles. 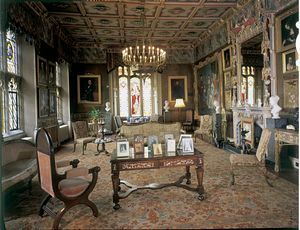 Interior rooms contrast the Gothic works of John Crace with the 20th Century designs of Sir Edwin Lutyens and other eras. 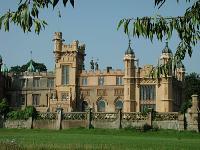 Knebworth is very much a lived in family home, and has undergone extensive restoration recently. 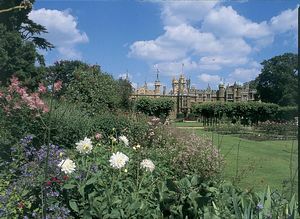 There have been gardens at Knebworth since the 1600's. The present layout dates from the Victorian and Edwardian times, with more recent additions and alterations. In their Victorian heyday, the Gardens were well known for their elaborate Italianate layout attributed to the eccentric statesman and author, Edward Bulwer-Lytton. 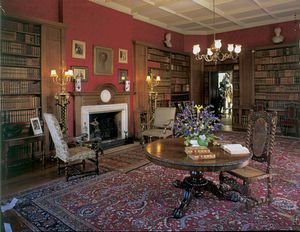 The central formal area was later simplified in 1911 by the Edwardian architect, Sir Edwin Lutyens. The Gardens feature the Lutyens-designed Pollarded Lime Avenues and Brick Garden, the Gertrude Jekyll Herb Garden, the Golden Garden, the Rose Garden, the Maze, the Kitchen Garden, the Pets Cemetery and the Wilderness Garden, which includes a self-guided trail of 72 life-size dinosaurs set grazing amongst the rhododendrons and redwoods. Knebworth Park has 250 acres of rolling hills and ancient chestnut and lime avenues which offer a quiet refuge for country picnics. It is also home to over 100 red and sika deer. Many special events are held during the summer months, including garden shows, car rallies and jousting tournaments. The Adventure Playground and miniature railway provide hours of fun for children. No dogs except guide dogs and hearing dogs in house and garden. Knebworth Park, near Stevenage, Hertfordshire, is 30 miles north of central London and 15 miles north of the M25, with direct access from junction 7 of A1(M) Stevenage South (A602). Frequent non-stop trains from Kings Cross to Stevenage - 30 mins.